Bracken ‘prefers’ dry, somewhat acid soils though it can grow in a fairly wide pH range. It spreads by means of its underground rhizomes (modified underground stems), sometimes at a rate of one metre per year. On bare ground (for example, after burning), it can establish itself by spores, produced in sori (reproductive structures) on the underside of the leaves / fronds. Often bracken is a pioneer species. It has been described as 'the perfect weed'. Bracken spores may be found in the cores taken for pollen analysis; these indicate that bracken has a long history in the U.K. landscape. Peaks of bracken spores are associated with loss of woodland cover in the last 2000 years, though there is some evidence for a decline in bracken in the 14th Century – which featured a number of cold (and wet) decades (the Black Death was rampaging across Europe). In the past, bracken had a number of uses – animal bedding (later composted to give a nutrient-rich mulch), thatching, a source of potash (pot ash = plant ashes soaked in water in a pot giving a soluble form of potassium K+). The harvesting of bracken in historical times probably limited its spread. However, it is now spreading and its dominance in some areas / habitats is a concern. Due to its height and large spread leaves / fronds, it can deprive other species of light and it produces a deep litter of its own dead, rusty-brown leaves. Bracken also produces allelopathic chemicals, that is, substances that inhibit seed germination and seedling growth of other plants. Thus, dense strands of bracken offer few opportunities for other plant species though bluebell may be found, and, in the New Forest – wild gladiolus. Various mosses find a home underneath bracken. Some insects feed on bracken – sawflies and moths, and it is also a habitat for the sheep tick (Ixodes ricinus – lyme disease) and some important Fritillary butterflies. If eaten, bracken can induce poisoning in cattle and sheep – it contains a toxin Ptaquiloside and the young leaves when crushed or eaten release hydrogen cyanide. So, how is the advance of this ‘perfect’ weed affecting our woodlands and their capacity to regenerate? Where there are plenty of seed-bearing trees and, therefore, a good seed bank in the soil, regeneration and replacement of mature trees (removed for timber or fallen through old age) will normally come from seedlings emerging through the ground layer. 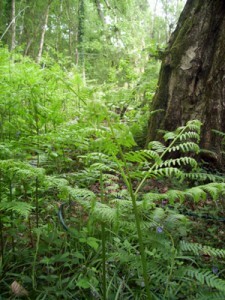 A healthy woodland has trees of all age classes, but bracken can stop this regeneration. 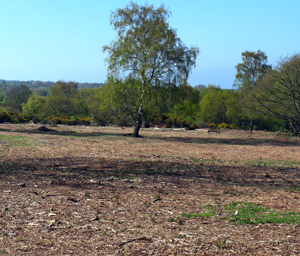 Planting 'whips' will have little success in a bracken-dominated ground layer. 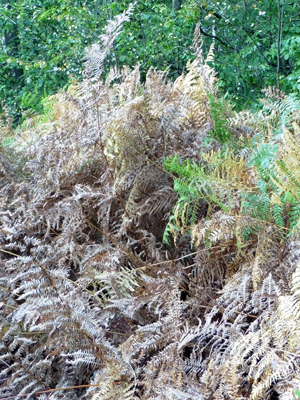 We had a HUGE Bracken problem in our wood when we first acquired it. We are on the edge of open common land and the encroachment is from there. After planting about 20 yeas ago the wood seems to have almost totally been neglected and the broadleaf area at the boundary to the common never closed its canopy due to losses (partly the wrong species for the location and party neglect). The bracken moved in and has suppressed any natural regeneration, aided and abetted by the sheep encroachment. The NT, who own the Common, seemed powerless to do much and the farmers using it for sheep grazing as disinterested as in the sheep encroachment. So we have therefore (in addition to strengthening the fenceline) taken it upon ourselves to cutting back a boundary on the common side of the fence, also fearful of the fire risk the dead bracken can cause in dry periods. We started 2 years ago by cutting 2x a year but in one area (for reasons I will not go in to) we cut once in July. We are now into our third year so it has not been defeated but is seriously weakened. Interestingly however the area cut once in July seems to have weakened the bracken significantly more than the double cut and also didn’t show a second (weaker) flourish to be cut back. I would love to hear others practical experience of what we refer to as “The Devils Weed”. To end positively, this is the first Springtime that we can see young seedlings and the beginnings of growth from many wild plants we have not seen before so that has renewed our enthusiasm for this tiresome task. Looks like the Bramble has also liked our efforts but at least that is useful! Have no experience of this but a quick google of “using bracken as mulch” gives many articles : for example, http://www.theguardian.com/lifeandstyle/2005/oct/02/shopping.gardens by Monty Don. Can you please explain more about the use of braken in the compost in my garden, would l find brakens between the salad? If they contain toxin can l still use in the compost. The reason lm asking is because l have lots of them in my woodland and l try to cut them down and they seem to slow down for other herbs to grow but l wouldn’t mind to use them if possible because of the bulk, can l use with the strawberry for bedding? Solar panels in woodlands and fields – are they good or bad for the environment?